Discover free spins and transforming wilds in the lost world of Atlantis. 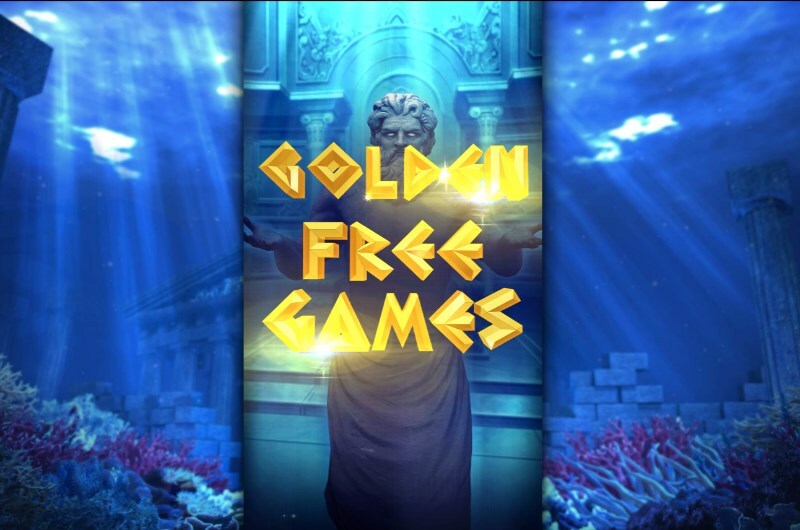 Dive into the aquatic depths of God of the Sea slots - an exclusive new game to Mayfair Casino. In this 5x4 and 30 payline mobile slot, you get to travel back to an ancient land of gods and glory. Explore a watery world and meet Poseidon, who could bless you with free spins and transforming wilds. The lost world of Atlantis is the perfect setting for this game. And this sunken land has been reimagined beautifully with excellent HD graphics and smooth animations. 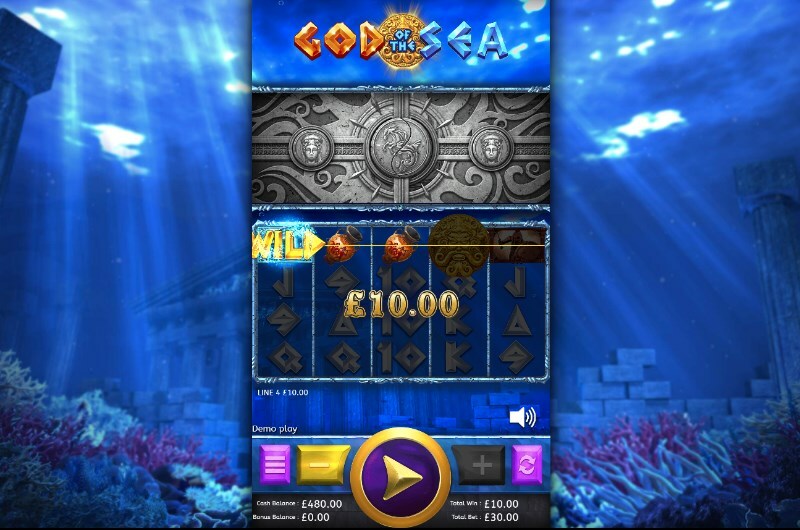 If you love Ancient Greek theme slots then you will be impressed with God of the Sea. Mayfair Casino's newest slot is foaming with bonus rewards. During the base game, you have the chance to activate two random bonuses. The first is the Goddess feature; a mysterious deity will shine a light on to the reels, transforming symbols into wilds. We also have the mighty warrior Ares, who will create a wall of shields. These will transform into high paying symbols or valuable wilds. But this is a game about the ruler of the sea - so it's no surprise that Poseidon upstages both of these mythical figures with his own bonus. First of all, we have the extra chance feature - five scatter symbols will be placed above the reel. A giant stone hand will then move a scatter symbol onto the reel on each spin, creating the opportunity for a bonus round trigger. With this feature, you could activate the God of the Sea slots bonus free spins - where you will journey through the depths of Atlantis. Poseidon will then offer you two magical orbs. Touch one to activate a random game feature. In the Silver free spins, you can look forward to extra wild symbols. But in the Gold free spins, you could land vast Olympian riches with stacks of wilds covering the reels. Want to play God of the Sea slots and wade the watery depths for big wins? Then you will first need to pick your stake. You can bet from just 30p a spin or from £30 a spin. Bigger bets will result in more godly prizes. Once you are happy, press the spin button to start playing. God of the Sea is a fixed payline slot - meaning you can't reduce the 30 lines in play. But there is a range of other helpful settings you can use. Enjoy fast spins with little downtime? Enable the quick spin option. There is also a comprehensive range of autoplay settings. You can set the slot to play for up to 100 spins. There is also a range of stop triggers you can use. You can set the autoplay to stop on any win, if a win exceeds a certain value or if your balance increases by a set amount. One of the most impressive myth themed slots to launch in years, God of the Sea slots is an aqua diamond. You will love the random bonus features - but it is the free spins where the game truly shines. Especially if you activate the gold free spins - which will bask you in winning chances thanks to those stacked wilds. What are you waiting for? Head over to the Mayfair Casino lobby and play this new game right now. Or read our God of the Sea slots review for more information.